Review: I enjoyed this book but not as much as others seemed to enjoy it. It was an interesting concept but it was also very dry. It was very description heavy. The Characters – I had no connection with any of the characters and didn’t really care about what happened to them. The insta-love between Etta and Nicholas was awful. There wasn’t really a relevance for Etta being a violinist so I don’t know why it was brought up so much. I didn’t realize that Nicholas was of colour (you’d think I’d pick up on that since this book was so description heavy). That is not something you read often so I love that Bracken put that in there. The World Building – This was great. I could actually imagine what was happening and the historical references were accurate and quite visual. The Plot – The time travel aspect was confusing. I honestly don’t really think I can tell you much of what happened. I listened to the audiobook while I was at work. It was 14 hours long and took me a month to get through. I think they time traveled twice, ran into some the bad guys, were lovey-dovey then came to some kind of conclusion. All that happened in a very slow pace. The Cover – The ship in the bottle definitely draws you in. Overall, I don’t think that I will be reading the sequel. I have no motivation really to know what happens next. I went into this novel after hearing seeing people giving it great reviews and finishing The Darkest Minds trilogy. What do you think of overly long novels? 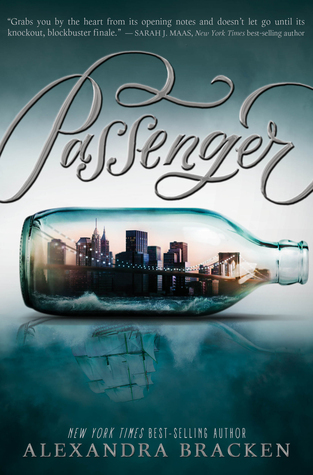 This entry was posted in Alexandra bracken, book review, passenger, review, Uncategorized and tagged book review. Bookmark the permalink.